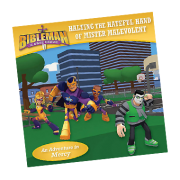 What’s better than a new Bibleman adventure? 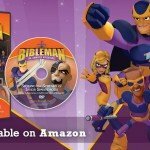 Two new Bibleman adventures! 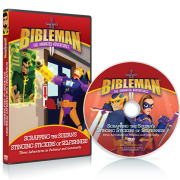 When you open this Bibleman Flip-Over book, you’ll find two exciting stories and learn two lessons from God’s Word! 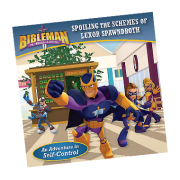 Read about how the Bibleteam teaches contentment in Stopping the Sultan of Selfishness. 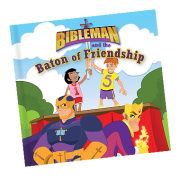 Then flip the book over to see them use truthfulness to take on another villain in Fracturing the Falsehoods of the Fibbler. 1. Stopping the Sultan of Selfishness (An Adventure in Contentment) Young Tariq is from a rich family, although his parents don’t just give him whatever he wants. Uh-oh—the family’s live-in butler is secretly buying Tariq expensive gadgets and gizmos. But why? 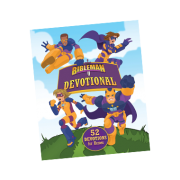 Bibleman knows why: The servant is really a wicked villain who targets the children of wealthy families. 2. 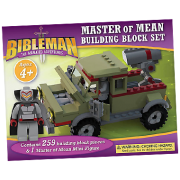 Fracturing the Falsehoods of the Fibbler (An Adventure in Truthfulness) The new kid at school isn’t fitting in. But when some students start mocking her, she pours out a blizzard of words that totally intimidate everybody around her. 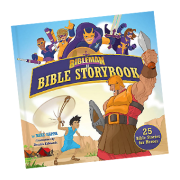 Wait, why is the Bibleteam getting an alarm just because a young girl stands up to some bullies? Is there more here than meets the eye?